SNS also has two kit clubs: The Stamp and Card-Making Video Kit Club is released on the 1st of each month and the new Multi-Project Kit Club is released on the 15th of each month. Subscribe to the SNS You-Tube Channel to get great inspiration using all the products available in each kit. 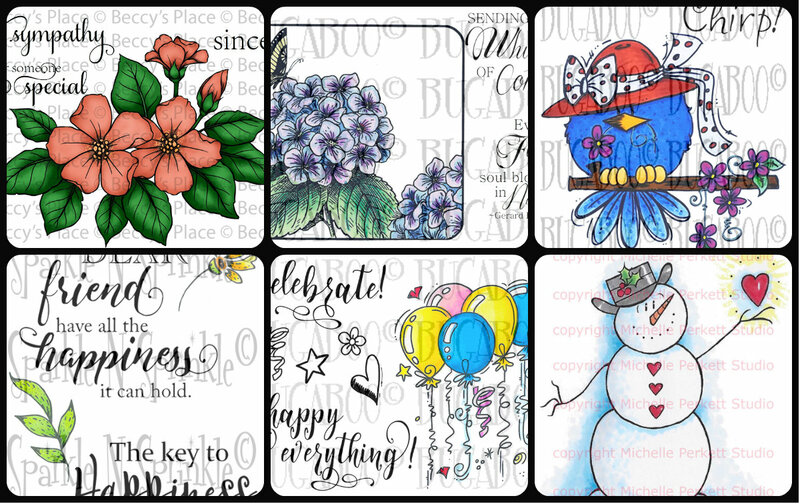 The Sparkle N Sprinkle Creative Challenge group is on Facebook and runs from the 1st - 25th of each month. A SNS image (either rubber or digi) is required. The winner will receive a $15 Gift Certificate to go shopping at the SNS store. Ho così colorato Pretty Blooms 00-873P5 con gli acquerelli perlescenti e ritagliato con l'aiuto delle forbici della Tonic. 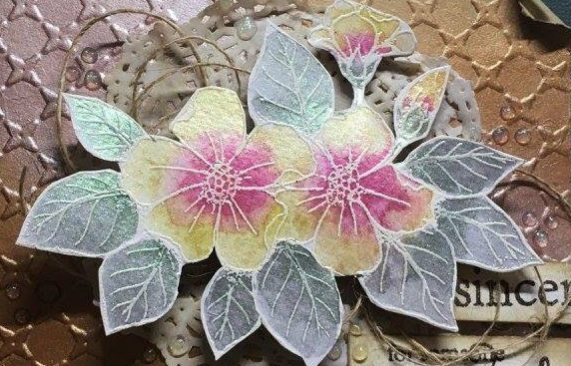 I painted Pretty Blooms 00-873P5 with pearlescent watercolors and cut them out with the help of the Tonic scissors. Pretty Blooms 00-873P5 è veramente stupendo !!!! 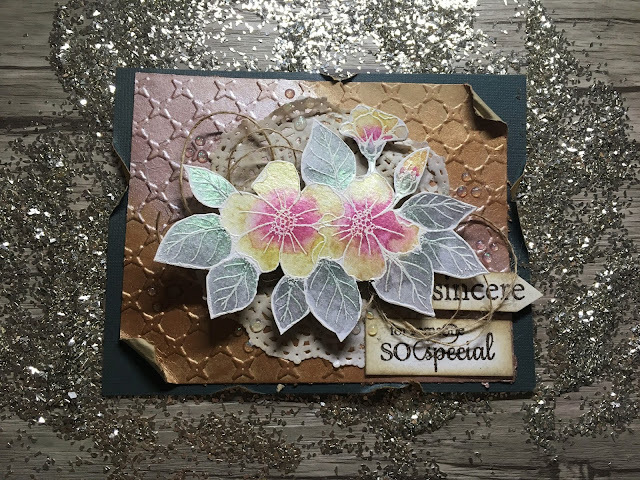 Sotto a Pretty Blooms 00-873P5 ho inserito un pizzo in carta sporcato con un tampone marrone e del twine color kraft; su carta acquerello ho timbrato i sentiments presenti in Pretty Blooms 00-873P5, ho ritagliato e sporcato anch'essi con un tampone di color marrone... Ho incollato Pretty Blooms 00-873P5 e i suoi sentiment con uno spessore e l'utilizzo della colla NUVO DELUXE ADHESIVE [200N]. Pretty Blooms 00-873P5 is really gorgeous !!!! Under Pretty Blooms 00-873P5 I inserted a paper lace soiled with a brown pad and a kraft twine; on watercolor paper I stamped the sentiments present in Pretty Blooms 00-873P5, I cut and soiled them too with a brown pad ... I glued Pretty Blooms 00-873P5 and its sentiment with a thickness and the use of glue NUVO DELUXE ADHESIVE [200N]. La colla NUVO DELUXE ADHESIVE [200N]. ha una tenuta perfetta!!!! The glue NUVO DELUXE ADHESIVE [200N]. It has a perfect seal !!!! La mia card è pronta!!! My card is ready !!! The next stop on the SNS Blog Hop is Jess. Fabulous card Sabrina. Love the background and all the added details. Gorgeous card! Love all the little extra details you added. Welcome to the SNS Team! Beautiful!!! Love the details you put into the pretty flowers!! These flowers are beautiful! Welcome to Sparkle N Sprinkle team - we are so happy to have you!! I love your coloring, and your card is gorgeous. Your coloring of the fowers is fantastic. I love your design and added embellishments. Stunning work! Beautifully created with beautiful details!! Stunning, fabulous background and great image and dimension! Magnificent coloring on your Pretty Blooms and I love all the texture you added to the design. This is so beautiful! Sabrina, love your card. The textures and layers are nice. Your color choices very pretty. Such pretty coloring on your blooms. The background really makes them pop! Great job!